We pride ourselves on being different. We don’t use a “template” design that we have used on previous jobs. We incorporate your thoughts, wishes, and wants with our ideas and come up with a unique design on every project. We specialize on the smaller projects, a backyard that needs two new sprinkler zones and three pallets of sod is a perfect example. So if you think your project is too small for a landscaper, but too big for you to tackle yourself, call us today! These are a low pressure and low volume head, great for domestic water applications. A lot of planning goes into where we will dig each trench. Perfect head to head coverage equals green grass. Robin from Emerald Desert Nursery is great to work with and has beautiful plants. These large trees will provide spectacular color in the Fall. A big tree needs a big hole. When planting trees, we dig the hole twice the size of the root ball and back fill with compost for extra nutrients. We like a good mix of plants that flow together. We love laying sod. Instant beauty! It takes a big crew to lay 9 pallets of sod in a timely and efficient manner. It's important to spread a starter fertilizer before and after laying sod. 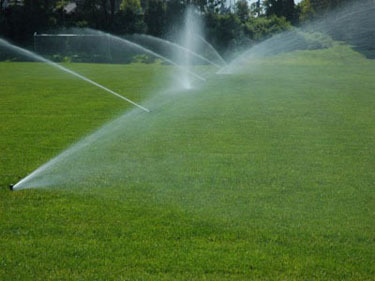 Sod is more expensive, but allows you to use your landscape way sooner than if you hydro seeded. Laying sod in early march. The grass is still dormant, but will wake right up with proper water and fertilizer. We can grade your job site. We have experienced operators that can get your job done safely and efficiently. The home owner did not want grass anymore. So we took a skid steer and removed it. We rent all of our larger machines from NC Machinery in East Wenatchee, WA. We haven't used this on a job yet, but are eagerly waiting too. 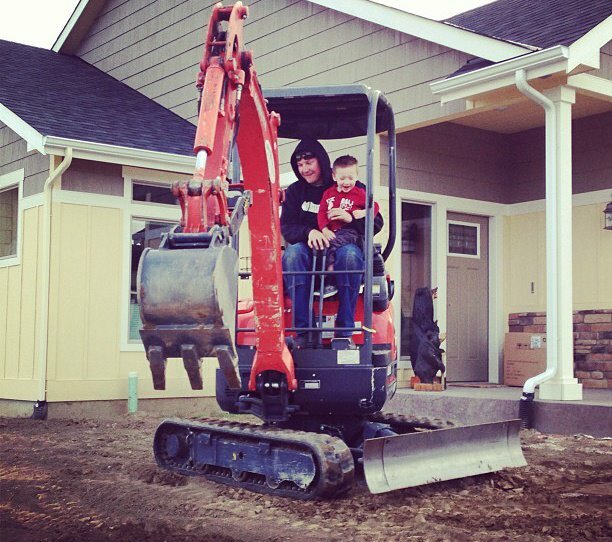 Travis Richardson, owner, is teaching his oldest son Mason how to run a mini excavator.